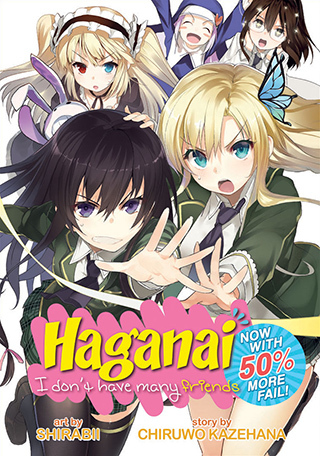 Book: Haganai: I Don’t Have Many Friends – Now With 50% More Fail! Welcome to the Neighbors Club! Pull up a chair! Have a soda… or is that a love potion? Just don’t get too comfortable, because the club is up to their usual shenanigans. You never know when you’ll find them engaged in questionable conversation about fetishes, or running a three-legged race to win the attention of the club’s unwilling “harem master,” or sharing a moment of bonding in the school bathroom. Whatever the event, you can count on the Neighbors Club to march to the beat of a different drummer. This spinoff collection of short stories continues their misadventures and misunderstandings like never before, in their ongoing mission to try — and fail! — to make friends.